Each Sunday, our family has a tradition that we play a game together. Our children cherish this tradition. There are a lot of games out there, and because we love games so much, we do own a lot of them. Five years ago (FIVE!) I wrote a post review on some games. Some games that seem like the perfect game for little ones don’t always work out. For example, Candy Land can be tricky in figuring out how to move along the path, and little ones aren’t always super interested in moving a game piece along a path. I can see why. I have also noticed throughout my four children that a game that was great for one wasn’t a favorite for all. Children have their own interests, strengths, and likes. This post contains affiliate links. Let me note that for a lot of the games I will list, there are fun themed versions. For example, for the game Trouble, you have versions for Frozen, Star Wars, and Despicable Me. If your child has a passion, it can be fun to get these. However, if you have multiple passions among your children, these can be difficult to get everyone excited over. Children also outgrow passions faster than they outgrow games. Toddlers are not competitive, so games that have some cooperation, goal they can visually see, or are exciting will hold their interest best. It is also best if they game can be over relatively quickly. Brinley loves the Uno Attack Game. It makes me a bit nervous because I don’t want cards bent, but so far, she has done well. She can match colors and numbers and she finds the cards shooting out quite exciting. Another great game is UNO MOO Game. It uses farm animals instead of cards and you put your animals into the barn, matching color or animal. If your toddler doesn’t put everything into his/her mouth, Hi Ho Cherry-O is a fun game. This is especially fun if your child likes counting things. I talked about Cootie in m other post. That is a good type of game for a toddler because you are building something and your toddler can see the progress easily. A game that is a similar concept that I like better is Disney Princess Enchanted Cupcake Party Game. This is obviously very girly, but the same concept. Instead of building bugs, you build cupcakes. Our favorite game when playing with toddlers up to grown ups is Cranium Hullabaloo. It is a fantastic game. It is extremely expensive on Amazon, and hard to find in stores, so you might have your work cut out for you to track one down that is affordable, but you will love the game. All of the games already listed are great for Preschoolers. Classic games like Candy Land or Chutes and Ladders are better suited for the preschooler age group (3-4) than the toddler age group (two year olds). Trouble is another fun game. This would be for an older preschooler. It is similar to Sorry, but easier for a preschooler to play since it is more straightforward. A favorite for our children as preschoolers has been Memory . This is fun for preschoolers on up. Children have amazing memories, so playing memory with a child is a nice way to be humbled. Memory has a lot of versions, from Curious George, to Frozen, to Dr. Seuess, to Super Heros…so you can find something of interest. If playing the game with all of the cards is overwhelming, and it can be for younger players, take out half of them and play with that. Connect 4 can be played by older preschoolers and is a game that can be fun for the parents, as well. Zingo is a very well rated game that is fun for multi-age groups. It is like Bingo, but it has a twist. Spot It is another fantastic game that works across age groups. It is a card game. I think you can play the original version (or one of the fun themed versions) with your preschooler and have fun, but there are Spot It Junior versions if you are wanting an easier version to play. This age range is the 5-8 crowd. They will still like most of the games already mentioned. Something fun for this age group is to look into the “junior” versions of your favorite games. Yahtzee Jr., Sequence for Kids, and Clue Junior are some ideas. This is a fun transition because you can choose games you enjoy–game night is getting more exciting! Sorry has always been one of my very favorite games, and this is a great age range to introduce it in. It is a great game for teaching children to be good sports. Bananagrams is a favorite for us. The recommended age for it is 7 and up. As soon as your child can spell words, your child can participate in this game. Ours have been able to do it in Kindergarten. Qwirkle is another great one. It is recommended for 6 and up, but our 5 year olds have always been able to play. Guess Who? is another great one that I have loved since the time I was a child and still do! Another fun one is Dominoes. If you have a LEGO lover in the home, you need to check out LEGO Creationary Game or the other games made by LEGO. Brayden loves these games. Creationary is my favorite of the ones we have played–it is like Pictionary but with LEGOs. You could always make your own version up–write up your own things to build from LEGOs and use LEGOs you have already. Pay Day was one of my favorite games growing up. It is as fun game we play that works well for the 5 and up crowd. Of all of the games our family plays right now, my favorite is Kinder Bunnies Card Game. This game is easy enough that McKenna can play on her own (and wins at times), but I find it fun also. If you like strategy games, you will really enjoy Kinderbunnies. Telestrations is a very fun game. We play this with my extended family often. Your child needs to be able to read independently before playing this game. It is a great group game! We play the Game of Life every so often. It takes a long time to play this game, but the kids enjoy it. They make a The Game of Life Junior Game. I love games and don’t mind having quite the collection, but perhaps because I want a lot of games, I don’t want a “Jr.” of games unless the original is just too challenging. The Game of Life Junior Game is rated 5 and up, and McKenna is 5 and plays the original fine, so I don’t know how necessary the “JR.” is here (although maybe it is faster, then it could be nice!). Full disclosure, Monopoly is my least favorite game. I am to Monopoly what the Grinch is to Christmas. It takes SO LONG! It is one of Brayden’s favorite games, though, so it gets played every so often (this is one I should get the Monopoly Junior of so we can play a short version of it). Battleship is a great two-player game for the pre-teen crowd. We have only played 7 Wonders once, but Brayden loved it. It is quite involved. I obviously haven’t played it enough to give full commentary on it. It rates extremely well on Amazon and is aimed for 10-14 years, so it is worth your consideration. 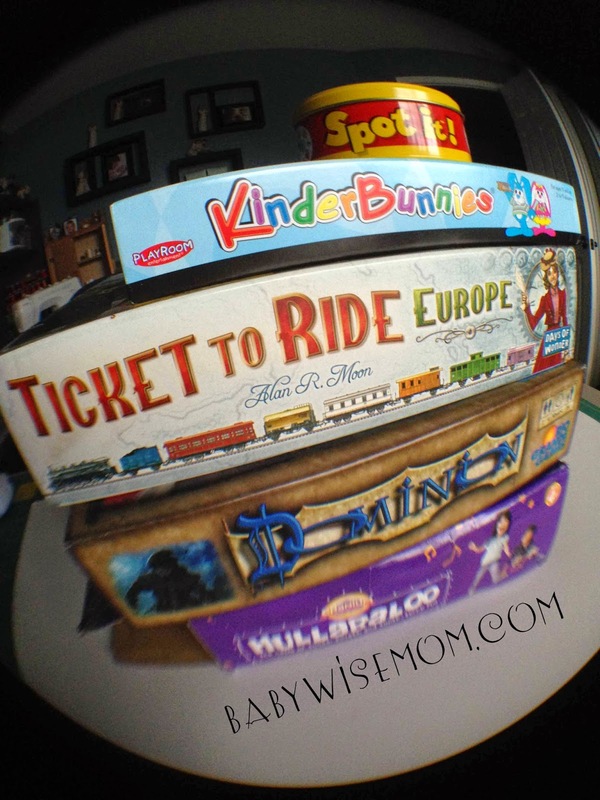 Ticket To Ride – Europe is another one of our overall favorite games to play as a family. It is over McKenna’s head, but she busies herself with “washing” the trains and placing trains on the board. The game involves strategy but doesn’t take forever to play. Like I said, we love to play games. We play with friends often. In addition to some of the games already listed above, we have some we like to play with friends. Dominion is one of our favorites and in the main rotation right now. It is great because it can change so much from game to game. It also doesn’t take an extremely long time. Most anyone who is into strategy games loves The Settlers of Catan. This is a favorite of ours, also, although it can take a long time so we don’t pull it out often these days (we must be getting older). This is probably my favorite game of all time. You need strategy, social skills, luck, and good planning. BANG is a fun card game. This is a good one for more of a party setting than a game night setting. Killer Bunnies is a game that frustrates me to no end, but my husband loves it as do some in our game crowd, so it has to happen from time to time. It drives me crazy because the person who wins is completely random–it has very little to do with your strategy and skill and very much to do with your luck. Imaginiff Game is a fun one for a party setting. It is not intense and is a fun way to get to know people. Wits & Wagers is another great party game. People who don’t love games seem to still enjoy this game. Finally, one of my favorite games is Cranium. This is a great game for a group of people. There you have my all-star favorite games. There are so many great games out there. I would love to hear your recommendations! What are your favorite games? Stephanie I will have to pull out hippos to try with brinley. I can see her getting a kick out of it. Thanks for the other suggestions! I have added them to our game wish list. You do need to come to our house! Rush Hour is a fun logic game and has won a bunch of awards. It is technically a single player game so maybe not a family game, but I have had fun "figuring it out" with my son and everyone in the family could take turns with it too. The box says 8+ but my 5 year old can do the easy cards and many of the medium cards so I think it can be adapted for younger kids. My son really really loves it! Ziggyslp, thanks! That looks fun. Solo games are good too, and that looks like it could be done in the car on long drives. Great recommendations! We are going to have to bite the bullet and get Ticket to Ride sometime. 🙂 Two that we love that are not mentioned are Sleeping Queens and Timelines: History. Sleeping Queens can involve addition if players want to get a small advantage. For kids who are not up to addition, it is pretty easy to figure out what cards to play when to awaken the sleeping queens. It is fun, attractive, I enjoy it, our 5-year-old can play it, our 8-year-old can play it, and visiting adults like grandmas usually like playing it with the kids, too. Timelines is a deck of small cards that have a historical event on one side and the event plus the year it happened on the other side. Each player gets a hand of cards and then takes turns playing a card in the correct order in the timeline that results. This is also fun and educational. Preschoolers and up can play it, just because you don't have to be able to read and get it right to join in. Even adults will get to a point where they find it hard to place their cards correctly. It's a great game for a big range of ages. Thank you Kristy! I have added those to my list! hi Val, great post, as always. my question has to do with how do you combine these activities when you have children of different ages? mine are 2 and 5.5, so their interests are quite different. we have a blast playing with shutes and ladders with my five and a half year old, while my 2-yr old is bored and rambunctious. Together, they can do crafts together (and by that i mean doing different things, but at least sit at the table together), play outside, and run around the house. but i haven't been able to get them to do other activities together. my husband and i seem to need to split our time between them. any thoughts?